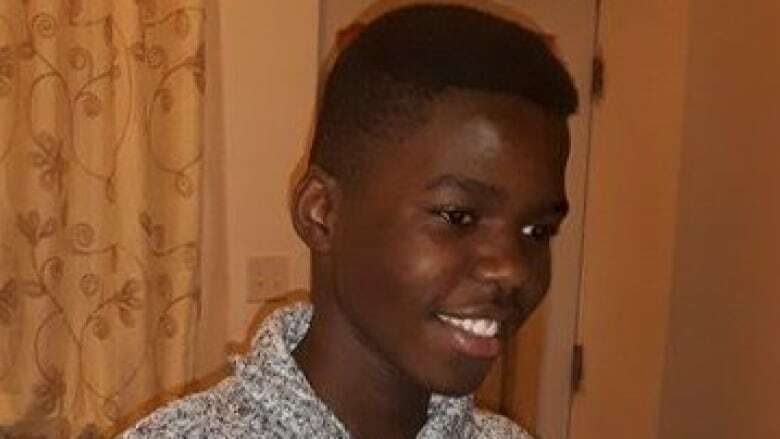 Blessing Moukoko was 14-years-old and taking part in his third swim class of the year the day he drowned, according to the report by Dr. Louis Normandin. 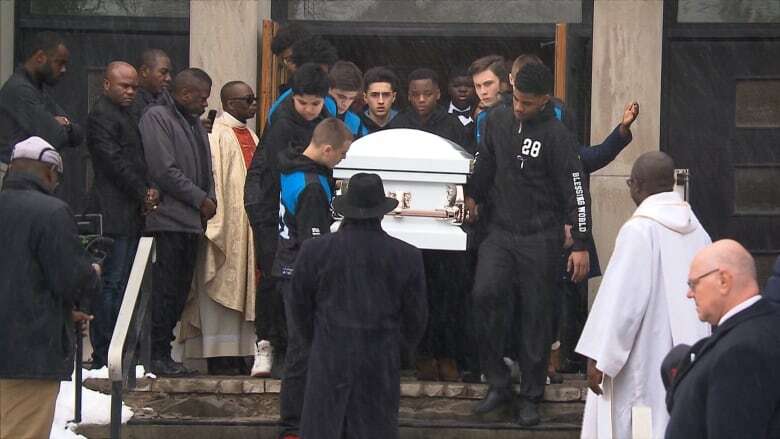 A Montreal teenager who drowned during his high school swimming class in February was likely at the bottom of the pool for almost 40 minutes before he was pulled out, according to a coroner's report. Blessing Moukoko was a 14-year-old student at École Père-Marquette in Rosemont, taking part in his third swim class of the year at Centre Père-Marquette, a community centre across the street, the day he drowned. Coroner Dr. Louis Normandin said since the students' gym teacher, who was a substitute, didn't have the necessary training to give the course, the lifeguard at the pool became a de facto second instructor. That meant there was no one in the lifeguard chair whose job was strictly watching over the 19 students in the class. The students' ability to swim was never formally tested — they were asked to raise their hands if they knew how. Many of the students in the class didn't know how to swim, or were weak swimmers. The gym teacher and lifeguard only checked the shallow end of the pool after the class ended, and did not walk around the entire pool or check the deep end before leaving, the report says. Normandin said there were environmental factors at play that made it difficult to see Blessing in the pool, such as the reflection of light off the water surface and a bottom that isn't visible from every angle. The coroner became emotional at a news conference Tuesday as he argued these factors only further justified the need for proper surveillance at the pool. "When you're a coroner, you only deal with deaths. People at the scene don't know what's going to happen. We see it all, a posteriori, and we see all the mistakes that were made. It's heartbreaking, because now he's gone, and he was only 14." The teen had a pulse when he was taken to hospital, but was declared brain dead two days later. His family eventually took him off life support. For schools to integrate the Lifesaving Society's Swim to Survive program, which teaches the basic skills needed to survive an unexpected fall into deep water, into their classes, and make it a prerequisite for any other swimming classes. That the minimum qualifications for those who teach swim classes in schools change — teachers should have to complete a 90-hour course as part of their bachelor's degree, and other instructors should have to complete a level two coaching certification. And that swimming classes be under the supervision of one person who is teaching the class, and a lifeguard whose only job is to do surveillance. Barring that, he said, swim classes in schools should be suspended until further notice. Junior Education Minister Isabelle Charest told reporters in Quebec City there are no plans to suspend the classes. 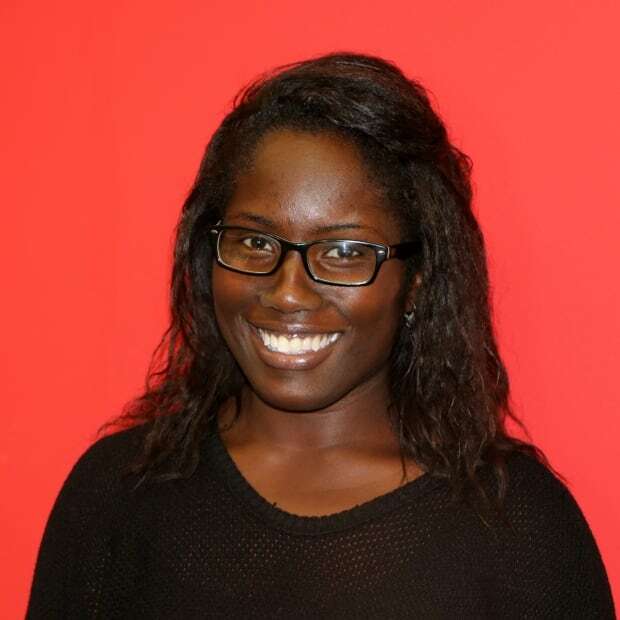 "Of course it's our priority to make sure we have a safe environment for the kids, and we want to [use] all the resources in our means to make sure they're in a safe environment," she said. She said there will be discussions around the Swim to Survive program, which is being taught in some classes, but not all. École Père-Marquette is part of the Commission scolaire de Montréal (CSDM). In a statement, the school board sent its "deepest sympathies" to the family, friends and the school community. 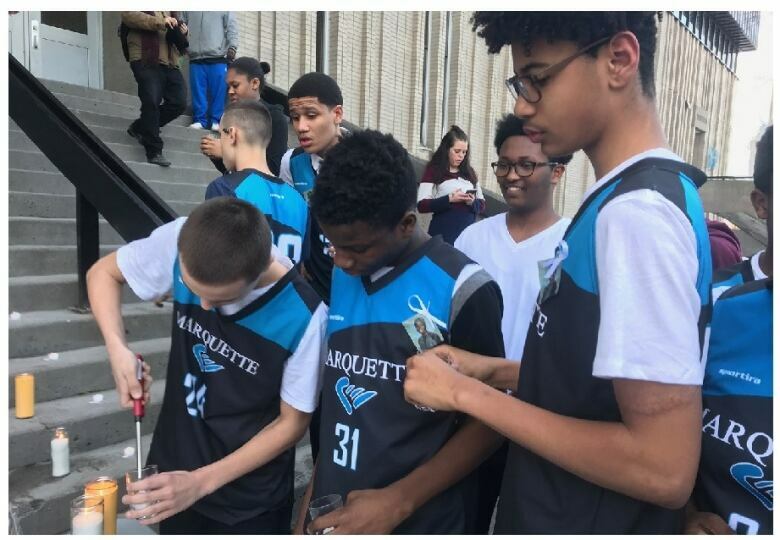 "The CSDM is taking note of the coroner's recommendations and will put the necessary measures in place.... Our duty is to do our best to strengthen our practices in order to prevent these events from recurring," said Catherine Harel Bourdon, the school board's chair. The report offers a breakdown of what happened that day, based on a surveillance video, information provided by Montreal police, the gym teacher, the lifeguard, other students who were present that day, the school and the CSDM. 9 a.m.: Blessing was seen doing laps in the pool, using the freestyle stroke. He started from the shallow end. Once he reached the middle, he stopped twice to take a break, then kept going. 9:10 a.m.: The students get free swim time. The teacher and lifeguard are at the side of the shallow end of the pool, even though many students are jumping from the diving board at the other end. 9:15 a.m.: The students leave the pool. Instead of a roll call, the teacher has the students hand in their self-evaluation forms. He realizes he doesn't have Blessing's, and assumes he just didn't see the teenager go into the dressing room. 9:30 a.m.: The second group of students arrive at the pool and gather around the deep end. They notice what they thought was a dummy at the bottom of the pool, and tell the lifeguard. 9:40 a.m.: The lifeguard jumps in to save Blessing. There is foam coming from his mouth. 9:53 a.m.: The ambulance arrives. 10:13 a.m.: The police arrive. 10:24 a.m.: Blessing's pulse stabilizes. He is taken to the nearest hospital, where his heart stops again, but he's revived. 12:34 p.m.: Blessing is transferred to Sainte-Justine hospital, where he is eventually declared brain dead, and later dies. After an investigation by Montreal police, Crown prosecutors decided not to press charges. "The prosecutor who analyzed the file has informed the relatives of the deceased that he was unable to prove a criminal act had taken place," Jean Pascal Boucher, a spokesperson for the Crown prosecutors office, said Tuesday. How well could he swim? The teacher gave Blessing a 4/5 mark for the class that day, and said he found Blessing was a better swimmer than many of his peers. However, those peers said Blessing had trouble keeping his head above water, that he was afraid of the water, and that he often seemed tired and short of breath. He would repeatedly grab on to the side of the pool in the deep end, they said. Blessing had self-identified as being unable to swim, and camera footage from the pool showed it was "obvious," Normandin said. "How do you explain that the teacher was not able to see what a 13-year-old boy could see right away?"